Google recently added support for paid Android apps (and first party app access) to 99 countries bringing the total of countries supporting the full Android Market to 131, beating Apple’s 90 countries in global reach. Middle Eastern countries such as Oman, Bahrain, Morocco and more still has no Apple App Store. Unlike Apple’s App Store the Android Market limits visitors by country (used to be by carrier) so you cannot simply create a US account to access the market. The list of 131 countries does not include major technology markets in the region such as Saudi Arabia, United Arab Emirates and Egypt! The rumors from February were incorrect. 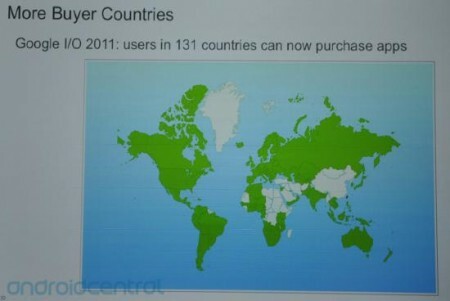 This is not the first time Saudi Arabia and UAE being shunned by Google as it happened before with Google Map Maker. It must be a regulatory or government licensing issue. So if you’re in Saudi Arabia you cannot update first party Google apps (Gmail, Google maps etc) or purchase apps without jailbreaking (rooting, voids warranty) then installing an app to fake your location. A troublesome process that’s not present in the Apple App Store.